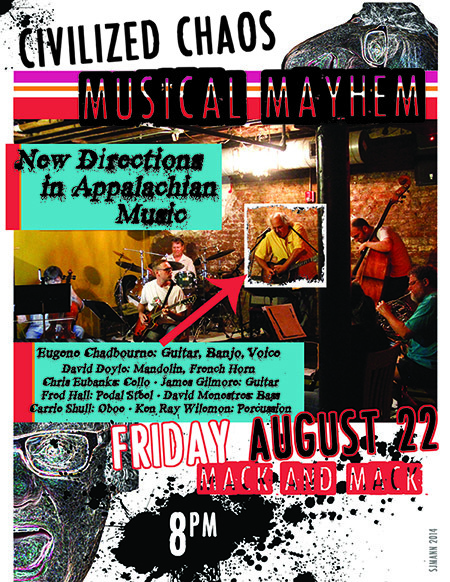 Hot on the heals of July’s residency in Raleigh, Dr. Eugene Chadbourne’s New Directions in Appalachian Music hits Friday August 22 at 8pm at Mack and Mack in Greensboro. Expect EC originals as well as standards by Cyndi Lauper, John Prine, Duke Ellington, Melvina Reynolds, Ray Davies, Thelonious Monk, Willie Nelson, and many others. Or perhaps we’ll play none of that. Who knows?